Sharp XE-A402 Electronic Cash Registers at Cash Register Store. REPLACED BY SHARP XE-A407. CLICK HERE. The Sharp XE-A402R's are large retail buyback cash registers. 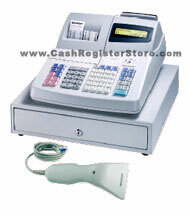 We therefore list them as refurbished model cash registers. These cash registers include a NEW factory warranty. The Sharp XE-A402R cash register is a very low cost scanning option. Basic features include a 2 station thermal printer, 2 line operator display, full size metal cash drawer and CCD scanner. Scan up to 1,800 plu's. Print out reports at the end of the day to view sales trends for popular selling merchandise. For a very low cost the Sharp XE-A402 offers great features. Nothing else compares in price. Although many features are standard, there are no upgrade options. This cash register is recommended for a smaller retail business that does not need higher end features such as upgraded scanners, remote printers or credit card interface capabilities. If a stand alone scanning cash register is all you need, then the Sharp XE-A402 is perfect for you.